If you have a small business you probably have a pretty informal relationship with most of your clients. New deals are worked out over the phone or in person and a basic contract is used to cement the deal or perhaps even a handshake. But what happens when you have the opportunity to conduct business on an entirely different level than you are accustomed to doing? 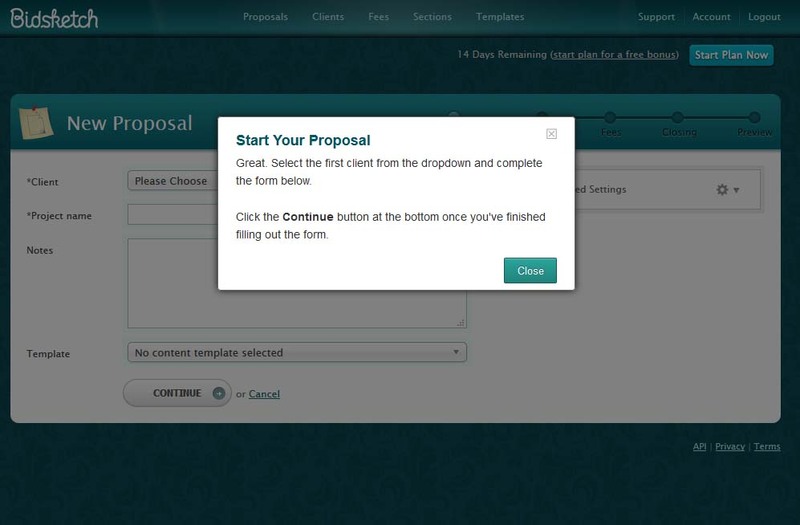 What do you do when a potential customer or client asks for a written proposal? In the past, for me, I have created a proposal in Word and then emailed or faxed to the recipient. It has worked OK. I have gained a fair number of clients this way, but I decided to do a little more research to see if I could get some fresh ideas to beef up my proposal presentation. I do what I often do in these situations – turn to the almighty Google. In my quest for tips on writing proposals I came across this page: https://www.bidsketch.com/proposal-resources/. I was so impressed with the breadth of information that I signed up to get a free sample proposal for my industry. I continued to explore and see what kind of business Bidsketch was in. The more I looked the more I liked. I wasn’t even in the market for a proposal software, but I found myself researching and looking at what other options were out there. I evaluated the websites of half a dozen different companies. I googled each company individually to find reviews. I looked at industry review sites, blogs, and anything I could find. I narrowed the choice down to Bidsketch and Proposify. They both looked like excellent services that were similarly priced. Bidsketch had a 14 day free trial and Proposify offered 30 days. Proposify seemed to have more bells & whistles, more features. But this is what it came down to…. Proposify was too “salesy” for me. The website was filled with LOADS of information about all their features. Features, features, features, features. On the other hand, Bidsketch had a very simple site with invaluable resources. In fact, one of the proposal strategies Bidsketch talks about is making your proposal about the client. Don’t talk about my company and all the STUFF we offer, but rephrase it all into how I am solving THEIR problems. That is the strategy I’ve always used in my proposals so I found this to be quite ironic, or maybe not. Bidsketch uses their website, in essence, as a generic proposal about why I should use their services. Then if you dig a little deeper you find resources that pertain to your specific industry and how you should create the proposal thereby solving MY problem. Proposify did not do that. With Bidsketch I was able to view samples and found tips on presenting proposals in my industry. Proposify did not do that. So even though Proposify may be a few dollars cheaper per month and have more features I wasn’t sure how helpful their templates would be. I continued going back to Bidsketch as a reference to measure everything else against. And that is why I selected Bidsketch. The sign up was easy. Tutorials walked me through the initial setup of my first proposal. The help section was actually helpful… to answer a few questions. I emailed on a question that I couldn’t find an answer to and had a response within a few hours. Not super fast, but at the same time efficient and timely. The bonus was that in answering my question he gave me another marketing idea to integrate into my proposal. I like the ease of use, the electronic signatures, and I really like the custom domain so when emailing to potential clients everything still has my branding including the URL. All in all it has been a positive experience. If you want to see the features you can find them on the website so I won’t be another boring review that lists all the features. I felt it would be more valuable to show the process I went through to get to my decision and get my overall sense after using it. One thing I did not find on the site (it may be there somewhere) was the complete list of all the templates available. Check it out below. Good luck in your business endeavors and if you ever need a revamped logo or website give me a shout and I’ll send you a very official looking proposal!